For the love of fresh fruit, WHY???? Why? Because he is the bloody Chess Pro! Why? because it is Sharpie, and they’re always fun. I thought he was more of a ska boy myself. Actually, this guy was on Discovery Health last night. 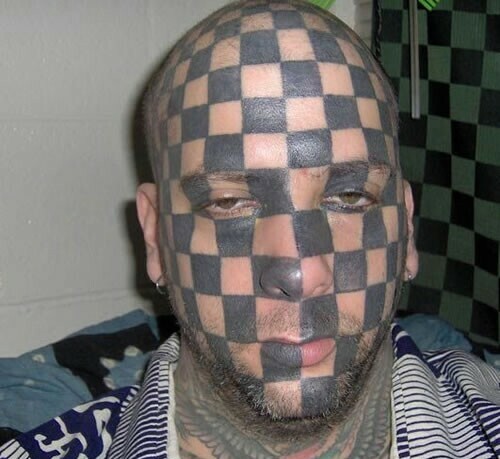 He’s got some defect where one side of his body (primarily his pectoral muscle and bicep) never fully developed, and he got the checkerboard tattoo to sort of get some sort of symmetry to his body, or at least give himself the image of it. I’ll see if I can find a source, although I want to say it was “Medical Incredible”. Anyone else out there see this?